When comparing prices on toe kick saw rentals in San Jose, Gilroy and Santa Cruz, ask about sales tax and environmental fees. Crain's toe-kick saw draws its name from the fact that it fits under the toe-kick of cabinets, which is handy as hell when you need to cut through old material to lay down a new plywood sub-floor without pulling the cabinets in the process. 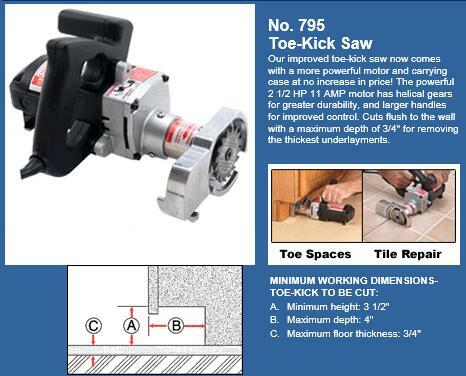 Minimum Toe Kick Height: 3-1/2"
Maximum Toe Kick Depth: 4"
* Please call us for any questions on our toe kick saw rentals in San Jose, Campbell, Salinas, Santa Cruz, Watsonville, Morgan Hill, Hollister, Santa Clara, Gilroy, Milpitas Sunnyvale, Fremont, Salinas, the Greater Bay Area and the Monterey Peninsula.